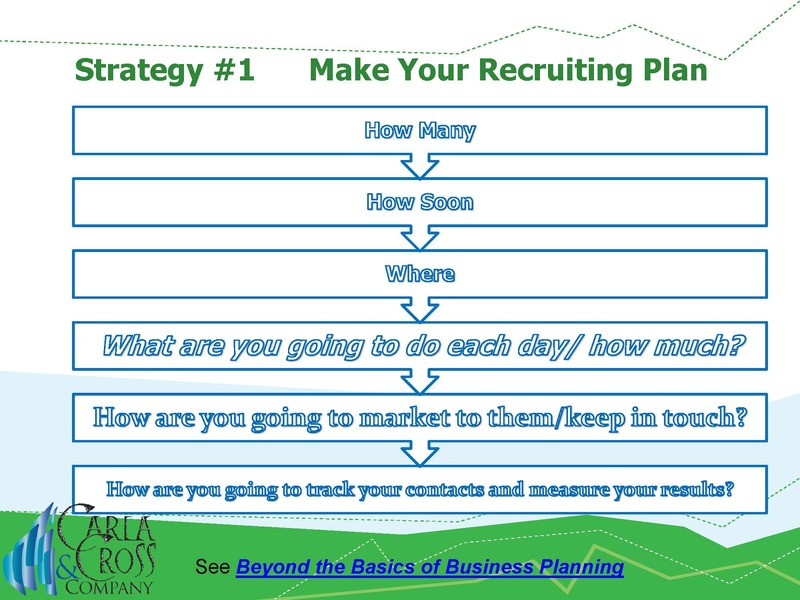 Do You Have your Recruiting Plan Done? Tips Here. 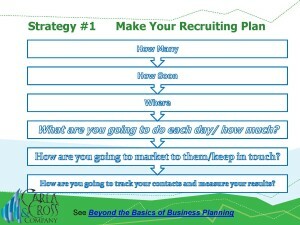 Do you have your recruiting plan done? This month, I’m featuring recruiting. Why? Because it’s the life blood of real estate success. Unfortunately, too many managers, though, don’t honor it as such. In a few days, I’m a guest for David Knox’s series of First Mondays webinars for leadership. My topic will be 4 strategies for successful recruiting in 2017. I’ll post the video on my website, Carla Cross, after next Monday. Okay. Let’s get real. Do you actually have a recruiting plan? If not, how do you know what to do each day to find great agents who would love to work with you? First, what in the heck is a recruiting plan? Isn’t that a great way to look at recruiting plans? They provide you a process and a system to recruit. 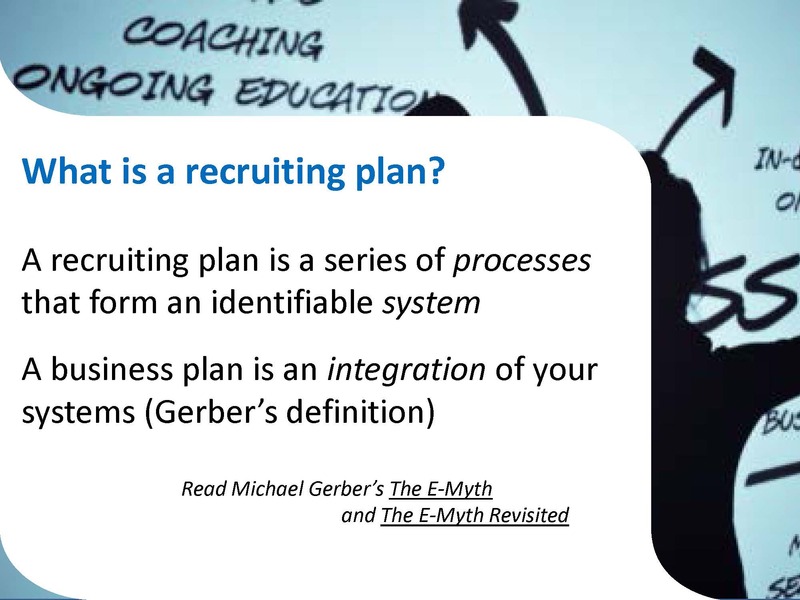 So, to have a recruiting plan that integrates into your overall process, you need a business plan. Now, you have the integration of all your systems. So, what should be in a recruiting plan? Do you have a schematic that helps you put all these variables into context? If not, you can find a planner inA�Beyond the Basics of Business Planning.A�my comprehensive online business planning site for agents and leadership. In my next posts, I’ll give you more tips on how to make your recruiting really pay off for 2017. But, first, get that plan done! Your Business Plan: Have a Systems Plan in Place? Do you haveA�systems needs built into your business plan? In December, I’m doing business planning in this blog and my blog for agents, Up and Running in 30 Days. Check back for free processes, checklists, and guidance. I know you have the same concerns as a broker. 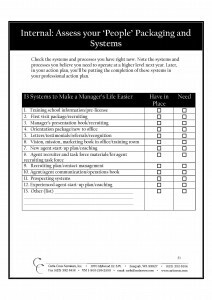 So, you need aA�systems plan in your business plan, just as I put a technology and social media planner in my 4th edition of Up and Running in 30 DaysA� and in Up and Running in Real Estate, my online training/coaching/accountability program. One of the mistakes we brokers make is to think all our problems will be solved if we just get everything ‘automated’ with technology. Well, let meA�tell you, it’s hard to automate people! Yet, we needA� people systems so we can be sure no one falls through the cracks. We need to assess our systems to assure each agent, at each stage of his/her development, is worked with. Otherwise, we fail toA�meet our segmented agents’ needs. For example: We may have wonderful seasoned agent training. But, we hire new agents with no orientation and no detailed, high accountability training and coaching. So, we have a huge failure rate with our new agents. Sound familiar? Click here to get your copy of my systems survey and planner. 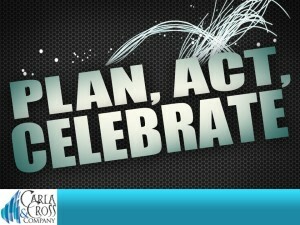 Use the planner to access your needs and then create an action plan for those needs in your 2012 business plan. Now, you’re on your way to saving time, money, and having systems you can delegate to free up your time. Check out Beyond the Basics of Business Planning: A planning system exclusively for real estate managers. Your Business Plan: Have You Created your Training Calendar? 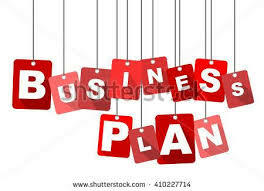 Through December, I’m focusing my blogs on business planning. Look for ready to use checklists, processes and systems to help you and your agents plan for a successful next year. 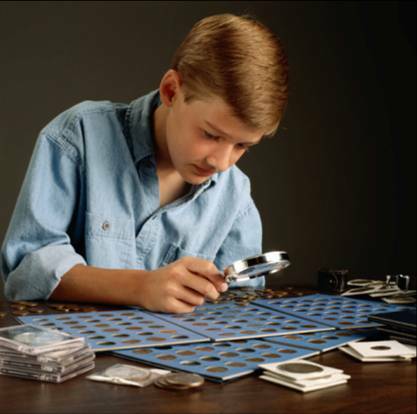 Youa��re putting together your business plan. How do you know what training to provide your agents? One method is to look at your profit and loss. Herea��s the other way to do it. Simply provide your agents an a�?internal review a��of their sales performance mastery (or not) as part of their business planning process. Click here to see the internal sales performance review, excerpted from my comprehensive online business planning program, Beyond the Basics of Business Planning. Have your agents rate themselves on their performance skills. You will see that they rate themselves lower than you would rate them. Why? Because we’re harder on ourselves than we are on others. What do you think the agents rate themselves lowest in? Youa��re right. Prospecting/lead generation. So, youa��ll want to create a�� with thema��a dynamic lead generating plan for next yeara��and coach them to it.A� See the lead generating plans for seasoned agents in Beyond the Basics of Business Planning,A�and, for new agents, in Up and Running in Real Estate. Your training plan should be a part of your business plan. Your training plan should tackle the challenges you have noted as a part of your own business reviewa��and of the agentsa�� business review. 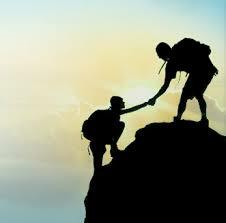 By the way, be sure those challenges you noted can be handled through training. For example: Youa��ve noted an ethics problem in your office. You want your agents to a�?be more ethicala��. Thata��s not a training problem. It is a selection problem. You cana��t train your way out of the ethics we grasped when we were 5! But, you certainly can solve a listings sold problem with training. Be careful when youa��re creating your training, and tackle the problems that you can solve with training. You’ve done your own analysis of your profit and loss statement. You’ve done your analysis with your agents. You’ve made your training plan. Now, you’re going to put it on a training calendar–and use it to guide your agents, your staff–and to recruit. Not only that, you have an integrated training system that you can delegate. Good work. Recruiting tip: Include your training calendar in your recruiting handout, in your faxes, in your emails, and in your social media. Let prospective agents know you are organized, and you are committed to their success. Checklist: Keys to being a great business planning coach. This month, I’m focusing on business planning. 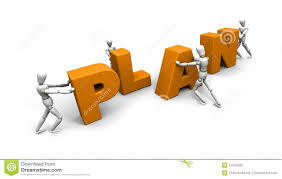 I want every professional to have a great plan for next year. Look for checklists, processes, and systems, too, ready to use. Excerpted from my agent business planning system,A�Beyond the Basics of Business Planning. WhatA�should be in a business plan? In November and December, I’m featuring business planning, so you can get a great plan AND coach your agents to great plans. Why? Because neither version of a business plan does you much good if you want to create a business plan that is usable every day. Click here to see the parts of a strategic business plan for a real estate agent (this would work for any salesperson). I created this a�?flow charta�� after being frustrated that there was no good business planning process or template for real estate salespeople. I found that there needed to be a clear a�?patha�� from the big picture planning aspects (vision/mission/objectives) to the action plan. I also found there had to be a clear delineation of the parts of the action plan. Why? Agents will focus on what they find easya��the business support parts of the plan, not the lead generating parts of the plan. By focusing on the review and action portions of your plan, you will have a real blueprint to follow to create success every day. Be very careful about which planning system you use. The way you think will determine the kind of plan you get. Follow the model I’ve provided her. Now, you have a usable business plan for 2017. Want to see more on business planning? Check outA�my complete online business planning programs, Beyond the Basics of Business Planning. 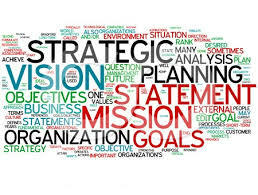 Is your business plan missing vision?A�Below is an explanation of why having a vision is so important to the success of your business plan. In fact, I believe the lack of vision in a plan leads to a demotivating and certainly uninspiring plan. 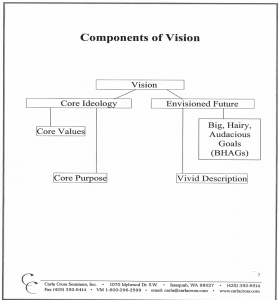 As you can see from the chart on the right, excerpted from Beyond the Basics of Business Planning,A�A�your core ideology is made up of your core values and core purpose. If you look at your life, youa��ll see that the things that inspire and motivate you are the things that adhere to your belief system. Thata��s what this part of the vision statement says about you. Your envisioned future is made from a vivid description of this future, and BHAGsa��big hairy, audacious goals. Those are goals five years out, that you really dona��t think you can attain. Provides guidance about what core to preserve and what future to progress toward.A� Made up of core ideology and envisioned future. Managersa�� exercise.A� To figure out what your core values are, imagine that you are opening an office on Mars. You can only take three agents with you on your spaceship. Name those three agents. What are the core values of these agents? Who in your office doesn’t exhibit those values? Why is he/she still with you? Looking back: Imagine you are at your own memorial, watching from above. What are others saying about you? Whata��s most memorable about you? What is a great goal you would love to accomplish in your business, but really dona��t feel ita��s possible for you within five years? Write it right now. Is that goal thata��s been eluding you congruent with your core values? What I mean by that is, does that goal feel comfortable to you? For instance, if that goal is that youa��ll make two million dollars, and you dona��t like the feeling of that much money, because your values are aligned differently, you just arena��t going to reach that goal. That, I believe is the reason many of us dona��t reach some of our goals. Those goals arena��t in alignment with our core values. You cana��t consistently perform in a manner that is inconsistent with the way you see yourself. Life is like baseball; ita��s 95% mental and the other half is physical. If youa��re like most real estate professionals, you create some type of a business plan this year. But, maybe it didna��t work for you. Or, maybea��you just didna��t work it! Join us Nov. 8 at 3 PM Pacific time) to get the answers you needa��and the inspirationa��to make a bullet-proof plan for next year. Carla Cross, CRB, MA, is the only real estate professional ever to have had her business planning system published internationally and used by thousands of successful real estate professionals. Carla also has written a business planning program for CRB, leading to the Certified Real Estate Broker designation. Shea��s an acknowledged expert, and has been working with Realtors for over 2 decades, test marketing her planning system and seeing results. Leta��s work together to create an unassailable plan for 2017. 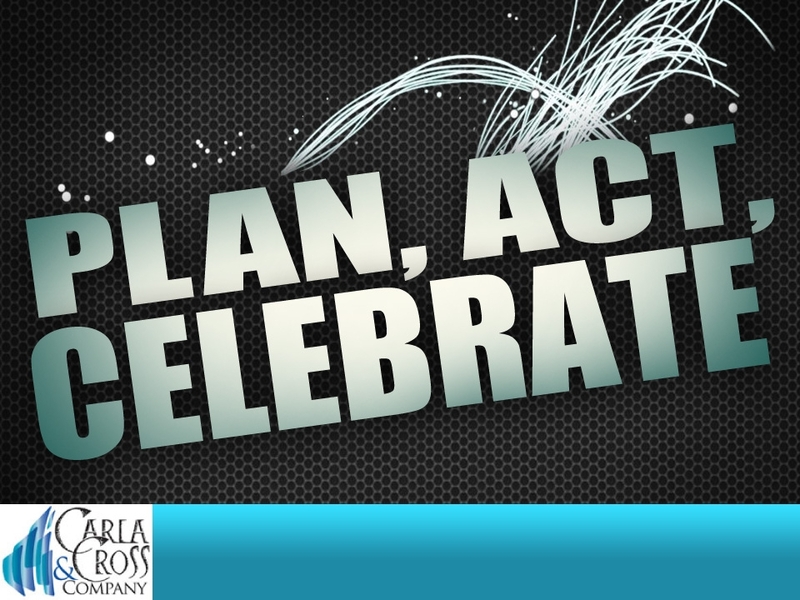 Managers: Youa��ll get tips on how to help your agents create great plans! Can You Answer These Business Planning Questions? 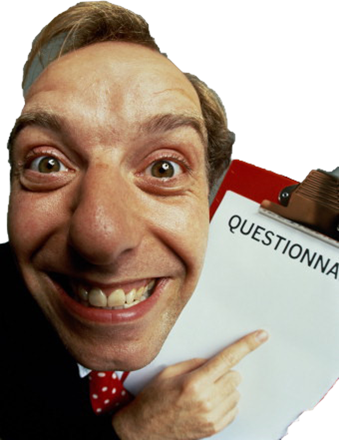 Managers: Invite your agents and get these questions answered, too, prior to the webinar! 1. What percent of your listings sold in normal market time last year? 2. How much money did you spend on your best source of business? 3. What should you do differently in 2017 to make more money, keep more money, and spend less time? These are three of the questions we’ll explore in our complimentary business planning webinar. Carla will give you tips on ratios, expenses, and tactics to assure you’re not spinning your wheels in 2017. Age disparity between clients and their agents and what it means to you! Before you read this, take my true-false a�?exama�� to test what you know about Realtor trends. Click here to get it. How did you do on the true-false a�?exama��? I didna��t create it to a�?testa�� you. I created it to crush some old assumptions. And, I want to point out what some of these trends mean to you and what we need to do about them. Every time a National Association of Realtor survey comes out, I eagerly get it. Why? It gives us clues into the trends and directions of our industry.A� There are two major reports that come out yearly or every two years: The Member Profile and the Profile of Buyers and Sellers. I highly recommend you get these reports* and use them to educate buyers and sellers. Youa��ll find you become much more credible when youa��re using statistics from a third party source, instead of trying to convince buyers and sellers youa��re righta��because you know youa��re right! Now, leta��s take a look anotherA�of these true-false statements (see my previous blog for the first commentary) Here’s how these statistics are important to you. Ia��ve put the number of the statement before my comments. False the median age of a Realtor has decreased. This, on its face is great. But, the median age of a buyer is still 44 years. And, the largest group of buyers (28%) are in the 25 to 34 age group. What does that mean to you? As a manager, youa��ll want to hire those who relate to the target markets you serve. Also, members are starting to retire. (Is this true in your real estate office? How are you going to keep your office fresh and alive?) Those 65 years and over dropped to 16 percent from 25 percent in 2015. Because the average age of a Realtor is 53, they are less fluent in social media and even computer skills. Because the largest group of buyers is aged 25-34, we have a mis-match between the agent generation and the buyer generation. Managers: Solve the problem. Hire more younger agents AND those making real estate their first career! Managers: What are you seeing in your office? In your area? Are these trends borne out there? What are you doing about it? Complimentary Business Planning Webinar Coming Up Nov. 8–Grab your Seat NOW! If youa��re like most real estate professionals, you create some type of a business plan this year. But, maybe it didna��t work for you. Or, maybea��you just didna��t work it! Join usA�Nov. 8 at 3 PM PacificA�time) to get the answers you needa��and the inspirationa��to make a bullet-proof plan for next year. Click hereA�for more information on the webinar and to register. Affiliates: You’re welcome to invite your agent and manager clients! I know you want to help your agents gain great business plans. 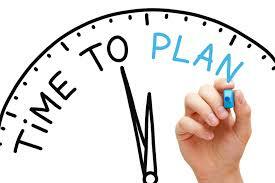 So, here’s how to schedule your business planning process. I’m sharing some tips with you on initial scheduling for business planning and on-going coaching to a business plan. You’ll see the dates in the schedule below are in January, because this is from a live webinar series I did for a real estate company. It would be better for you to start the process sooner.A� I’ll address on-going coaching in my next blog. Hand out the planning pages and say ‘have a nice day’. Instead, you must have a schedule to assure the agent gets that plan written. 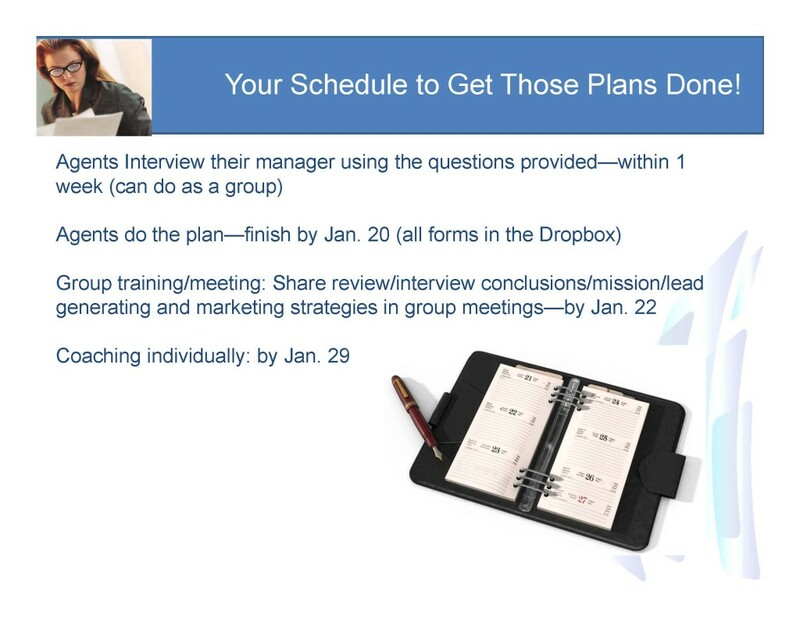 Scheduling an interview: When I’m teaching this as a course, or doing a webinar, I give the agents questions to interview their managers–questions that reveal what the managers foresee as strengths and challenges and trends in the marketplace and in their offices. See that interview scheduled below. Now, you’ve educated the agents about business planning. 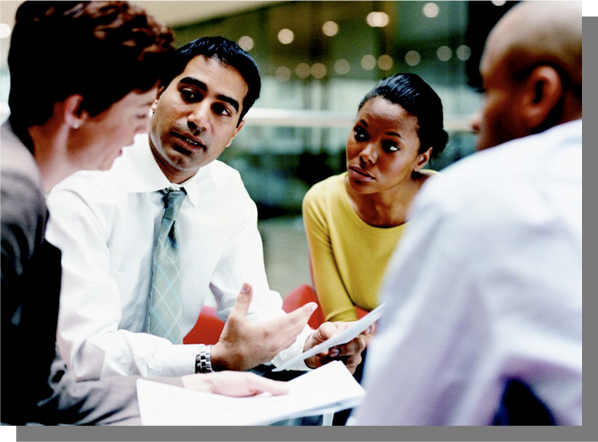 You’ve team ified and created confidence with your meeting. Finally, you’ve set appointments for individual coaching for the plan. In my next blog, we’ll discuss how to use the business plan for coaching all year, so you’re fully imbued in the success with each of your agents. Want Some Support to Get Your Agents Business Plans? Webinar coming up: Join Carla as she shows you how to make business planning fun, exciting, and creative–and get a GREAT 2016 plan. If you’re a pro, if you want to create a fun, successful, fulfilling career, you need the right kind of business plan. Don’t wait to step up to the next level now. Join us! Space is limited, so sign up now. This is a complimentary session, from Carla Cross, CRB, MA, who wrote the internationally published book on business planning, along with business planning courses for most of the major franchises. She’s tested her system ‘in the trenches’ with real agents–so she knows what works. Click here for more information and to register. Get inspired to make a great 2016 plan! 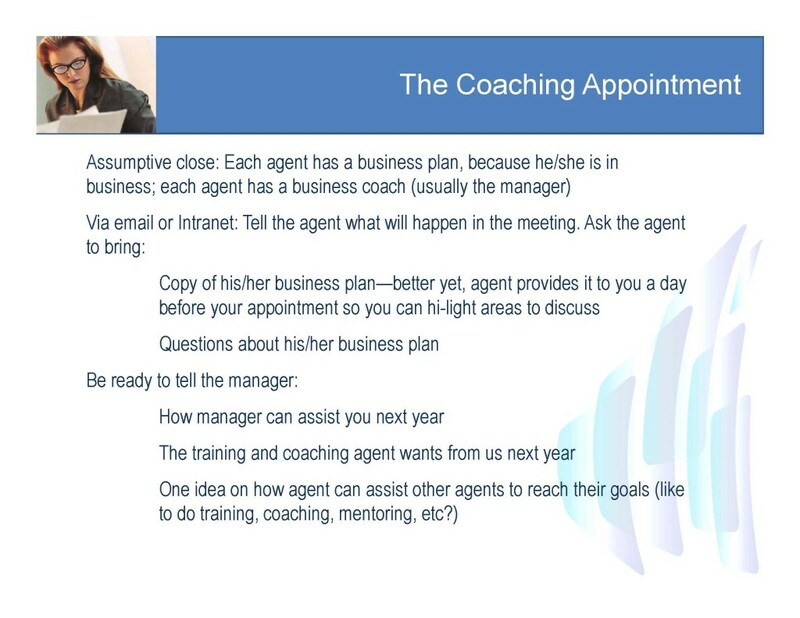 Want Help in Getting your Agents to Plan? Why not contact me to find out how I can educate your agents on business planning and support and coach you as a leader. Give me a call at 425.392-6914 or email me at carla@carlacross.com. I can do a webinar series for you, supply you will all the planning documents, and help your leadership coach your agents–at a very affordable cost with big pay-off for you.